KitMonsters – Roland Juno-6. The music makers’ guide to making music. 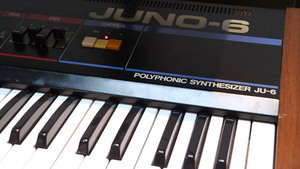 The Juno-6 was the first in a series of affordable quality synths from Roland’s Juno family. It’s a six voice polyphonic analog synthesizer and is very stable thanks to its digitally controlled analog oscillators. The Juno-6 sounds great and is a vintage classic loved for its bass, however it lacks modern basics like MIDI control and patch memory storage. The next generation Juno-60 version added 56 patches of memory storage. Both of these synths sound virtually the same and are considered by many to sound better (punchier) than the popular follow up, the Juno-106. The Junos have been used by Nick Rhodes of Duran Duran, Enya, Sean Lennon, Sneaker Pimps, Vince Clarke of Erasure and Banco De Gaia.